Donn Fulton Eisele (June 23, 1930 – December 2, 1987) (Colonel, USAF) was a United States Air Force officer, test pilot, and later a NASA astronaut. He occupied the command module pilot seat during the flight of Apollo 7 in 1968. After retiring from both NASA and the Air Force, he became the Peace Corps country director for Thailand, before moving into private business. Eisele was born June 23, 1930 in Columbus, Ohio, and graduated from West High School in 1948. He was an Еagle Scout. He received a Bachelor of Science degree from the United States Naval Academy in 1952, and chose a commission in the United States Air Force. He received a Master of Science degree in Astronautics from the U.S. Air Force Institute of Technology, Wright-Patterson AFB, Ohio, in 1960. He attended and graduated from the Aerospace Research Pilot School (Class 62A) at Edwards Air Force Base, California in 1962; his classmates included Charles Bassett and Theodore Freeman. Eisele was a project engineer and experimental test pilot at the Air Force Special Weapons Center at Kirtland Air Force Base, New Mexico. He flew experimental test flights in support of special weapons development programs. He logged more than 4,200 hours flying time, 3,600 of which were in jet aircraft. Eisele was part of NASA's third group of astronauts, selected in October 1963. In early 1966, Eisele was quietly selected as Pilot for the Apollo 1 crew, along with Command Pilot Virgil I. "Gus" Grissom and Senior Pilot Ed White. But after dislocating his shoulder twice during training in January 1966, Eisele was replaced by Roger B. Chaffee. After corrective surgery on January 27, Eisele was named to the crew for the second manned Apollo flight, with Command Pilot Walter "Wally" Schirra and Pilot Walter Cunningham. At this time, Eisele was promoted to the Senior Pilot position. 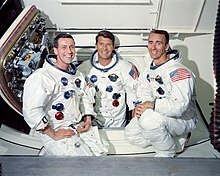 In December 1966, Apollo 2 was cancelled on the grounds that it would be an unnecessary repeat of Apollo 1, and Schirra, Eisele and Cunningham became the backups to Grissom's crew. But after Grissom, White and Chaffee were killed in the Apollo 1 spacecraft fire of January 27, 1967, Schirra, Eisele and Cunningham were named to fly the first manned Apollo mission. It would ultimately be called Apollo 7. As the launch date approached, Eisele's participation was at risk; he was having an extramarital affair with a woman who would later become his second wife. 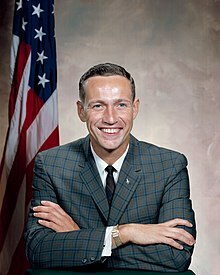 Astronaut Office Chief Deke Slayton had warned the crew that they were all "expendable," and that any extramarital affairs must not become public. Eisele remained on the crew, and on October 11, 1968, Apollo 7 was launched on an 11-day mission—the first manned flight test of the third generation United States spacecraft. By this time, the Senior Pilot title was changed to Command Module Pilot. Together with spacecraft commander Schirra and Lunar Module Pilot Cunningham, Eisele performed simulated transposition and docking maneuvers with the upper stage of their Saturn IB launch vehicle, and acted as navigator, taking star sightings and aligning the spacecraft's guidance and navigation platform. The crew completed eight successful test firing maneuvers of the service module's propulsion engine. They also tested the performance of all spacecraft systems, and broadcast the first live televised coverage of crew activities. Apollo 7 was placed in an Earth-orbit with an apogee of 153.5 nautical miles (284.3 km; 176.6 mi) and perigee of 122.6 nautical miles (227.1 km; 141.1 mi). The 260-hour, four-and-a-half million mile (7.25 Gm) shakedown flight was successfully concluded on October 22, 1968, with splashdown occurring in the Atlantic, eight miles (15 km) from the carrier USS Essex and only 0.3 miles (0.48 km) from the predicted target. Eisele logged 260 hours in space. Eisele served as backup Command Module Pilot for the 1969 Apollo 10 flight. Eisele resigned from the Astronaut Office in 1970 and became technical assistant for manned spaceflight at the NASA Langley Research Center, a position he occupied until retiring from both NASA and the Air Force in 1972. In July 1972, Eisele became Country Director of the U.S. Peace Corps in Thailand. Returning from Thailand two years later, he became Sales Manager for Marion Power Shovel, a division of Dresser Industries. Eisele then handled private and corporate accounts for the investment firm of Oppenheimer & Company. He moved to Wilton Manors, Florida, in 1980. In 1981, Eisele was appointed to a vacant seat on the Wilton Manors City Commission, and served in that political office for roughly one year. After Eisele's death, the City of Wilton Manors named Donn Eisele Park in his memory. Eisele also was a guide in the 1986 Concorde Comet Chase flights out of Miami and New York. Eisele died at the age of 57 of a heart attack while on a 1987 business trip to Tokyo, Japan, where he was to attend the opening of a new Space Camp patterned on the one at the U.S. Space & Rocket Center in Huntsville, Alabama. Eisele was cremated in Japan, and his ashes were buried in Arlington National Cemetery with full military honors. Eisele was an Eagle Scout, a member of Tau Beta Pi, and a Freemason, belonging to Luther B. Turner Lodge # 732 in Columbus, Ohio. Among the honors he received during his career were the NASA Exceptional Service Medal, the Air Force Senior Pilot Astronaut Wings, and the Air Force Distinguished Flying Cross. He was a co-recipient of the AIAA 1969 Haley Astronautics Award and was presented the National Academy of Television Arts and Sciences Special Trustees Award in 1969. Eisele was a part of a group of Apollo astronauts to be inducted into the International Space Hall of Fame in 1983. He was one of 24 Apollo astronauts who were inducted into the U.S. Astronaut Hall of Fame in 1997. In 2008, NASA posthumously awarded Eisele the NASA Distinguished Service Medal for his Apollo 7 mission. A family-approved account of Donn Eisele's life appears in the 2007 book In the Shadow of the Moon. Eisele's posthumously discovered memoir Apollo Pilot was published by University of Nebraska Press in 2017. In the 1998 HBO miniseries From the Earth to the Moon, Eisele was portrayed by John Mese. In the final three episodes of the 2015 ABC television series The Astronaut Wives Club, Eisele was portrayed by Ryan Doom. Susan Eisele Black donated a sample of a Moon rock to Broward County Main Library on behalf of her late husband, on October 23, 2007. Broward County Library, located in Fort Lauderdale, Florida, is the only library in the United States to have a lunar rock on display. The moon rock is exhibited at science museums and schools. ^ "Donn F. Eisele Colonel, United States Air Force". Arlington National Cemetery. Retrieved June 21, 2016. ^ "Donn F. Eisele". Find a Grave. Retrieved June 21, 2016. ^ a b c d e f g h i j "Astronaut Bio: Donn F. Eisele". NASA Johnson Space Center. Retrieved August 2, 2015. ^ "Information Summaries Astronaut Fact Book" (PDF). NASA. Retrieved December 5, 2017. ^ a b c "Command Module pilot on Apollo 7, the first manned Apollo flight". New Mexico Museum of Space History. Retrieved December 4, 2017. ^ Eisele, Donn; French, Francis; Black, Susie Eisele; Teitel, Amy Shira (2017). Apollo Pilot: The Memoir of Astronaut Donn Eisele. Lincoln: University of Nebraska Press. pp. 7–12. ISBN 978-0-8032-6283-6. OCLC 946906316. ^ Teitel, Amy Shira (December 4, 2013). "How Donn Eisele Became "Whatshisname," the Command Module Pilot of Apollo 7". Popular Science. Archived from the original on February 23, 2017. Retrieved June 22, 2016. ^ "Eisele to have Operation on Left Shoulder" (PDF). NASA. Archived from the original (PDF) on February 25, 2017. ^ "Chariots for Apollo, Appendix B". www.hq.nasa.gov. Retrieved 2018-06-29. ^ a b French, Francis (February 22, 2002). "'I worked with NASA, not for NASA': An interview with astronaut Walter "Wally" Schirra". collectSPACE. p. 4 (of 5). Retrieved May 1, 2012. ^ "APOLLO ASTRONAUT DONN FULTON EISELE DIES AT AGE 57". Washington Post. December 3, 1987. Retrieved December 4, 2017. ^ "Services Set For Astronaut Donn Eisele". Sun Sentinel. December 4, 1987. Retrieved November 20, 2017. ^ "Donn Eisele Park". Wilton Manors. Retrieved November 20, 2017. ^ Maurer, Yolanda (March 16, 1986). "Comet Chasers Line Up For Look At Halley`s Aboard Concorde". Sun Sentinel. Retrieved December 4, 2017. ^ McQuiston, John (December 3, 1987). "Donn F. Eisele, 57; One of 3 Crewmen On Apollo 7 Mission". New York Times. Retrieved December 4, 2017. ^ "Astronaut Eisele to Be Buried at Arlington". Los Angeles Times. December 4, 1987. Retrieved December 4, 2017. ^ ""America's Astronauts" - Masonic First Day Covers". The Phoenixmasonry Masonic Museum and Library. Retrieved June 21, 2016. ^ "First Apollo flight crew last to be honored". collectSPACE. Retrieved October 20, 2008. ^ "Outward Odyssey: A People's History of Spaceflight Series". Archived from the original on June 10, 2016. Retrieved June 22, 2016. ^ Robbins, Gary. "The guts and glory of forgotten astronaut Donn Eisele". ^ "The Astronaut Wives, Full Cast and Crew". IMDb. Retrieved December 4, 2017. ^ "First Library in America to Receive a Moon Rock for Public Display" (PDF). Broward County Commission. October 9, 2007. Archived from the original (PDF) on May 16, 2008. Wikimedia Commons has media related to Donn F. Eisele.